The nation's largest mall, Bloomington's Mall of America near Minneapolis-St. Paul, is embarking on a mission to bring more Chinese shoppers to the venue's 520 shops and seemingly endless corridors. Challenge number one for the Mall of America is that most Chinese people never have heard of Minnesota, much less the mall. When it comes to shopping, they generally hit New York, Los Angeles, Chicago and Las Vegas stores and malls. Doug Killian, senior director of the Mall of America's four-person international tourism department, told local media Chinese shoppers loved to shop, loved designer brands and loved good values. Mall operators saw "tremendous potential given the size of that market and the assets the mall has," he said. Mall of America management has tried to raise its Chinese profile recently. Officials since 2008 have attended large-scale annual travel trade shows at Beijing and Shanghai. They hired a Chinese marketing company in May to work on the mall's behalf with tour operators, arrange travel promotions and place advertisements in Chinese media and websites. Mall ownership wants to grow the number of Chinese shoppers by more than 10 percent annually. Noting Chinese shoppers love good values, mall officials want to tap into China's international tourists, who spend an average of $5,400 during each trip. This week, the mall was putting the finishing touches on a Mandarin version of its website. It features a Chinese women talking about the Minnesota's flourishing theater scene along with the various brands available at the mall. Mall of America publicity also was emphasizing cheaper prices than shopping on the East and West coasts, no sales tax on many products and acceptance by 40 percent of its stores of UnionPay, China's most popular debit and credit card. Some stores even have hired Mandarin-speaking workers to accommodate Chinese tourists. About 50,000 Chinese citizens shopped at Mall of America last year, an increase of 20 percent over th last five years. They mainly were students at the University of Minnesota and business people, not tourists. 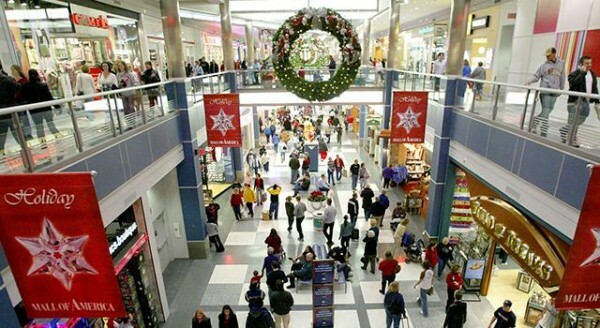 The mall attracts 42 million shoppers annually with half coming from Minnesota and bordering states. About 30 percent were U.S. tourists and 7 percent were international travelers.